Many young professionals are often caught up in the excitement of receiving a sizable paycheck, but they fail to make a plan for what they are going to do with it. Not setting short-term and long-term financial goals can lead to frivolous spending without limits, which can make it more difficult to save money. Think about where you see yourself in the future. When would you like to purchase a car or home? How much do you want to have in savings by a certain point? Knowing where you want to go and coming up with a plan for your money can help you with budgeting as well. Writing and sticking to a budget is crucial for everyone, but this is especially true for young adults in the first phases of their financial journey. Without a budget, people might find themselves spending more than they should or even living paycheck to paycheck. Tracking your spending and being cognizant of where your money goes might lead to a realization that you are spending more than needed in unnecessary categories. Budgeting can help with that — it gives you boundaries and limits on what you can spend and where, freeing up more money to save, invest, pay off debt, or get you another step closer to achieving financial goals. This is another big item. In addition to existing education loan debt, 20-somethings are prone to piling on more debt in the form of credit cards. Credit cards make it easy to purchase things without immediately receiving a bill, so many people fail to consider the repercussions. Often, they will carry a balance from month to month by only paying the minimum amount. Do not make this mistake — credit card debt can be crippling to your financial health and can negatively affect your credit score, keeping you from getting the best rates on future purchases. Instead, use your credit card(s) responsibly by keeping your credit utilization ratio below 30 percent and paying off the balance each month. That way, when it comes time to buy a home or new car, you will be more likely to get the best rates, potentially saving you money on interest in the long run. One of the first goals to set when starting the professional chapter of life is establishing a solid emergency fund. Financial experts recommend saving up at least three to six months’ worth of living expenses in case of emergencies. Many people in their twenties tell themselves that they can simply use their credit card for an emergency, or that emergencies will not happen to them at all. However, life is unpredictable — you never know when your car might break down, you take an unexpected trip to the emergency room, or your company needs to lay off some of its employees. It is better to be prepared for anything that could happen than to be blindsided by an emergency and not have the money to cover it. It can be very easy to put off saving for retirement. After all, you are in the early years of your life and career, and retirement is a distant thought. However, the earlier you get started, the better because that means that there are more years between now and retirement for interest to compound. If your employer offers a 401(k) plan, you will want to start contributing as soon as possible. According to a recent survey, 39 percent of retirees said they regretted not saving for retirement sooner. Try not to be part of that statistic and start saving immediately. 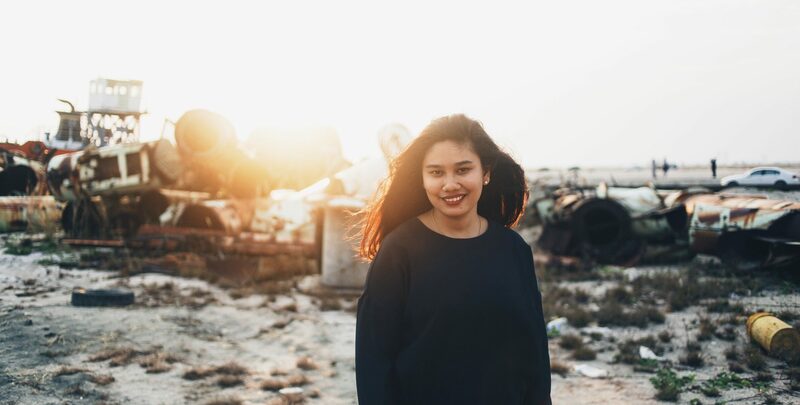 As a young person with the world at your fingertips and a paycheck in hand, making damaging financial decisions is easy — and the moves you make now can impact your life for years to come. To start out your finances on the right foot and enjoy financial success in the future, educate yourself on the financial mistakes people make at this age and vow to avoid them. Set goals for yourself, create an effective budget and stick to it, save up for emergencies, build good credit, and start saving now for retirement — you will be thankful you did. Pay Down Student Loan Debt or Invest In a Traditional 401(k)? Student loan debt in the United States has amounted to $1.5 trillion according to the Federal Reserve. This large student loan debt burden has affected many young people who are looking to start families and create a life for themselves. Despite this tough obstacle, many young people still have excess savings and need to determine what to do with these savings. Should they take their savings and invest in a traditional 401(k) or use that savings to pay down their student loan debt? We’re going to share different situations all spanning 10 years that involve paying down student loan debt and investing in a traditional 401(k) plan. Let’s say you have a taxable income of $150,000 and file taxes jointly with a spouse. Under the new 2018 tax brackets, your effective federal tax rate is 16.59%. Let’s also assume you have $70,000 of student loan debt with 10 years left at a 7% interest rate. Your monthly student loan payment would be about $812.76 assuming you’re making the same payment amount every month. What should you do? Pay down the student loan or invest in a traditional 401(k) account? Let’s start off by taking a look at how you can pay this debt down faster. Did you know that if you pay an extra $100 a month in addition to your regular student loan monthly payment, you’ll save $4,464.13 in interest paid? Not only will you save money by paying extra every month, but you’ll cut down the overall repayment period by a year and a half. Yes, you’ll be debt-free a year and a half earlier than you thought! $812.76 + $100 = $912.76 Monthly Payment After being debt free sooner than expected, you may decide to start investing in your 401(k). If you put all of the money you were paying from your student loan into your 401(k), you’d contribute $1,094.31 monthly. You may be wondering how you can contribute more money towards your 401(k) than your student loan payment. The answer lies in taxes. Student loan payments are made with post-tax income. 401(k) contributions are made with pre-tax income. Since a traditional 401(k) account uses pre-tax income, you are able to contribute more towards your 401(k) than you would have your student loan debt with the same income. Though you don’t pay taxes on 401(k) contributions, ordinary income tax will be applied on 401(k) distributions. $912.76 / (1-16.59%) = $1.094.31 Monthly Contribution After a year and half of contributing $1,094.31 per month, compounded monthly, at an assumed 7% rate of return, you would have $20,826.09. The investment amount of $20,826.09 combined with the student loan interest savings of $4,464.13 would give you a total 10-year net value of $25,290.23. If you have a higher priority of saving for retirement than paying off your student loan debt, you may want a different option. Let’s see what would happen if you decided to put that extra $100 a month into a tax-deferred 401(k) account. The $100 would be contributed to your 401(k) account instead of your student loan debt balance, but you would continue to make monthly student loan debt payments. Due to the pre-tax nature of a 401(k), your contribution of $100 post-tax would become $119.89 pre-tax. $100 / (1-16.59%) = $119.89 Monthly Contribution With an assumed 7% rate of return, compounded monthly, on your 401(k), you will have approximately $20,872.19 in your 401(k) after 10 years. Some employers will match your 401(k) contributions up to a certain percentage of your income. This could be a real game-changer. Turning down your employer’s 401(k) match is like throwing away free money. If you have student loan debt, but your employer offers a match, consider contributing to receive the maximum employer match. If you contribute $119.89 a month with an employer match while making your normal student loan payments, your money can really grow. If your employer matches the 401(k) contribution dollar for dollar, you will double your investment of $20,872.19 from Scenario 2 to $41,744.37 in your 401(k) account after 10 years. Contributions to a traditional 401(k) are made prior to your income being taxed. The withdrawals on a traditional 401(k) are taxed. The tax rate that is applied to your withdrawals depends on your tax bracket in retirement. As the average person’s career develops, they typically continue to increase their salary and move into a higher tax bracket. Upon retirement, they will see a decrease in income and move to a lower tax bracket. This means your 401(k) withdrawals could be taxed in a lower tax bracket if done while in retirement, instead of in your working years. Note that this will only be the case if your retirement income is less than your working income. 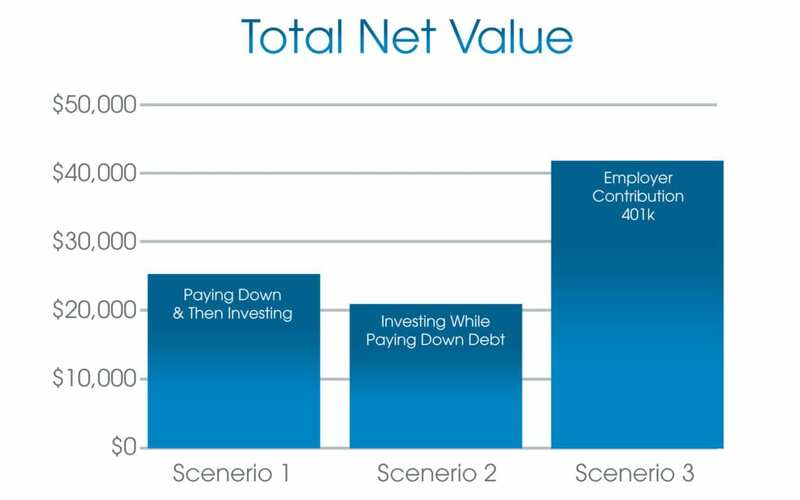 As you can see from the chart above, investing while paying down student loan debt or paying down debt than investing produces almost the same total net value. One debt pays down and investment strategy might perform better than the other depending on the return in the 401(k) account. It’s important to keep in mind that the returns on a 401(k) account are never guaranteed The real deciding factor on whether to invest or pay down your student loan debt will be if an employer offers a 401(k) match. Matching contributions from your employer will make investing significantly more attractive than paying down debt. If an employer match to your 401(k) is available, it’s wise to take advantage of it. Your comfort level with your student loan debt can be a large factor in your decision to invest in a traditional 401(k) account or to pay down debt. Knowing whether you are more interested in being debt free or being prepared for retirement can help you make a decision. Let’s look at how student loan refinancing can help you amplify your student loan debt pay down and investment strategy. In Scenarios 1, 2, and 3, the big question was whether you should use the additional $100 a month to pay down student loan debt or invest in a 401(k). What if you wanted to spend that $100 a month instead? Is it possible to find a way to save on student loan debt while spending that extra $100 a month? You’re in luck! This can be done with student loan refinancing. Now, what happens if you refinance your student loan debt, pay down the debt, and then start investing? Refinancing your student loan debt will cut your interest rate, saving you $70.30 a month, making your monthly student loan payment now $742.46 instead of $812.76 per month. By taking the additional $100 a month and the $70.30 in student loan savings from refinancing and applying them to your monthly student loan payment, you will be debt free two years and three months sooner than expected. Two years and three months are earlier compared to the one and a half years from Scenario 1. Just a reminder, in Scenario 1, there an additional $100 a month put towards your student loan debt. With refinancing and making the same monthly payment as Scenario 1, you will save $13,017.87 in interest over your original loan. $742.46 + $70.30 + $100 = $912.76 Monthly Payment Now that you’re debt free, you can use the money that would have been used for your student loan payment to contribute to your 401(k). Since 401(k) contributions are done with pre-tax income, you will be able to contribute a pre-tax amount of $912.76, which is $1094.31. $912.76 / (1-16.59%) = $1.094.31 Monthly Contribution After two years and three months of contributing $1,094.31 per month, compounded monthly, at an assumed 7% rate of return, you would have $32,085.89. The investment amount of $32,085.09 combined with the student loan interest savings of $13,017.87 would give you a total 10-year net value of $45,103.76. Now let’s try refinancing while you simultaneously pay down debt and invest. In this scenario, you will cut down the interest rate on your student loan debt from 7% to 5% by refinancing. You’ll be contributing the pre-tax amount of the extra $100 a month and $70.30 a month in interest savings towards your 401(k). You will end up contributing a total of $204.17 a month to your 401(k) account. ($100 + $70.30) / (1-16.59%) = $204.17 Monthly Contribution With an assumed 7% rate of return, compounded monthly, you will have approximately $35,544.87 in your 401(k) after 10 years. Combined with the interest savings of $8,436.09, you will have a total net value of $43,980.96. 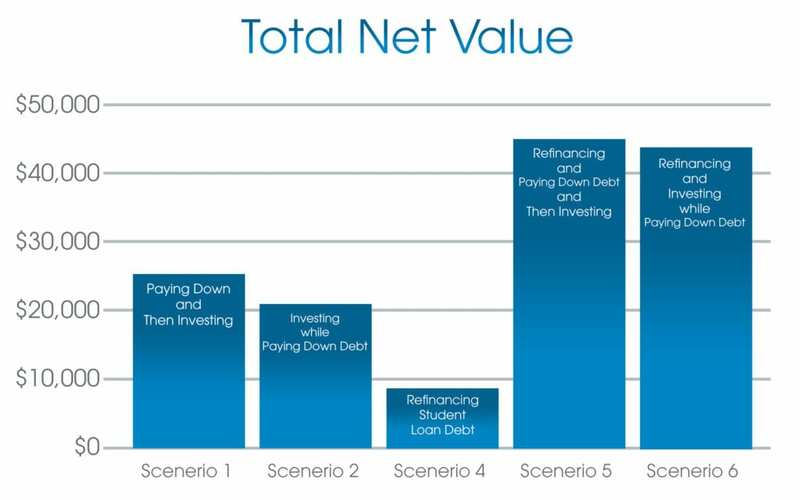 Scenario 1 – Paying Down Then Investing Scenario 2 – Investing While Paying Down Debt Scenario 4 – Refinancing Student Loan Debt Scenario 5 – Refinancing and Paying Down Debt Then Investing Scenario 6 – Refinancing and Investing While Paying Down Debt As you can see from the chart above, just from refinancing your student loan debt, you can save money and increase your total net value. If you take it one step further and supplement your debt pay down and investment strategy with student loan refinancing, you would approximately double your total net value! By taking advantage of student loan refinancing, you will be able to supercharge your debt pay down and investment strategy. For those who are just trying to save money on student loans or have more money to invest in their 401(k), student loan refinancing is the way to go. NOTICE: Education Loan Finance by SouthEast Bank is not authorized to provide tax advice or financial advice. If you need tax advice or financial advice contacts a professional. All statements regarding 401(k) contributions assume that you have a 401(k) plan and that you are able to contribute those amounts without contributing more than the current federal law limits. Third Party Web Sites Education Loan Finance by SouthEast Bank is not responsible for and has no control over the subject matter, content, information, or graphics of the websites that have links here. The portal and news features are being provided by an outside source – The bank is not responsible for the content. Please contact us with any concerns or comments. People usually think of completing college in four years as a typical timeline. In reality, many undergrads find that working in the summer or studying abroad can add extra time to getting their degree. According to the NY Times, only 19% of college graduates at public universities finish a Bachelor’s Degree in four years. Most experts use the timeline of six years to complete a Bachelor’s and three years to complete an Associate’s Degree. There’s nothing wrong with taking more time, but there are advantages to getting college completed early. Here are some reasons you may want to take an extra class each semester or stay on campus for summer classes to finish early. Less time in school means less money spent on college. Think about the extra fees you pay each semester. From parking permits, recreation center fees, and fees charged per department. The longer that you’re in school for, the more you will end up paying in fees. Taking more classes at once won’t save you on overall tuition necessarily. Taking more classes will lower the amount you’re paying for being in school, over time. Plus, tuition has the tendency to go up over time, and rarely goes down. Therefore, taking more classes now could save you on tuition in the long run since you’ll avoid rate hikes. The cost of college will depend on the type of college you attend. The cost difference between public school and private schools may be surprising. When looking at the cost of public schools whether a college is in-state or out-of-state from your current residence will also play a role in the cost. We broke down the cost of college into three separate categories public in-state, public out-of-state or (public OOS) as can be seen below, and private. We calculated the costs for a 4-year completion, 5-year completion, and 6-year completion. These costs were based on averages provided by Value Penguin. The below graph shows what the cost for 6 years of school will ultimately cost the borrower at each of these three types of colleges. The cost of a private college for six years equates to the cost of a Rolls Royce Wraith. Just to put that in perspective for you, Gwen Stefani the previous singer of the band No Doubt owns this car. It’s important to understand if something like studying abroad will set you back a semester or not. Yes, studying abroad is a great experience, but are you prepared to tackle the debt that may come along with delaying your academic career? Public In-State School - $172,277.15 Public Out-Of-State School - $266,177.15 Private School - $325,937.15 The overall cost of college can seem overwhelming, but it’s important to understand what you’re spending by staying in school longer. It will help you to understand if the cost of an education is worth the field that you are studying to enter into. In addition, the college that you choose will have an impact on what you have to pay to achieve that education. For example, if it takes you five years to graduate there could be a price difference of about $128,050.00. The cost of college really is impacted by the type of school you choose in addition to the amount of time you spend there. Public In-State School - $142,255.75 Public Out-Of-State School - $220,505.75 Private School - $270,305.75 It’s tough these days to graduate from college in 4 years, but it’s still doable. If you work closely with your counselor and study hard you’ll be on the right track. If you need summer classes they are typically available as well. Public In-State School - $112,799.70 Public Out-Of-State School - $175,399.70 Private School - $215,239.70 If you enter college determined and know what you want to do, it will save you a decent amount of money. The difference between graduating in four and six years can be extreme in some cases. 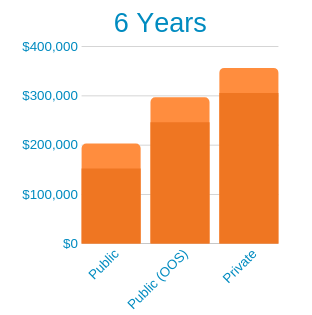 Below is an illustration of the cost difference between four and six years. Notice the cost difference specifically between a public out-of-state school and a private school. Public In-State School - $59,477.45 Public Out-Of-State School - $90,777.45 Private School - $110,697.45 One of the most important parts of preparing for college is understanding how you will pay for it, how long you’ll be in school for, and if you can graduate early. If you have the ability to graduate early you should certainly consider it. At the same time, it’s important that you don’t overwhelm yourself. Get to work, work, work, work, work. It’s hard to apply for a job and commit to a typical work schedule when you’re still in school. If you can work throughout school and put contributions to your loans that is a great thing to do. If you can’t work at a traditional job, that’s okay too, but be sure that you are doing all the work you can to finish early. Completing your degree earlier can give you the ability to start looking for a job in your career field earlier. That extra year or two of working at a professional career job will put you at an advantage. Bring home the (much better) bacon. With your degree completed, it’s likely that you’ll qualify for higher-paying positions in your field. If you already have a job that you like and want to stay with the same company, chances are you’ll be worth more once you’ve got that degree in your hand. When you’re done with school, you’ll have more time to work, build your resume, or balance commitments with life. Lots of students experience burnout, especially when they’re working while going to school, or taking a heavy study load. Add things like internships and clubs to that list and it just sounds overwhelming. Post-college, you will likely have more time to balance working, taking care of yourself, and pursuing other hobbies. Working full-time is still a commitment, but compared to working, taking 18 credits, and being in a student org. graduating might feel like a relief to your schedule. Spend less money on college living. It might make sense to have a meal plan or live on campus while you’re in school. Be aware those things are notoriously more expensive than how the rest of your community probably lives. By getting a shared apartment with friends or other young professionals, meal planning each week and doing your own shopping - you can usually save money. Have more control over your schedule. You know how it goes with classes. Sometimes you try to fit all of your classes into two days so you can have more free time. Try using your free time to work or study on days off. Coming across a required class that doesn’t pair with your schedule can ruin a lot of possibilities. By graduating, you’ll have fewer of those college-imposed restrictions on your time. Sure, many of us joke about the downsides of adulting, but it’s also nice to pick where you live and what you do. You can make choices like how to budget and what your financial and personal goals are. If you’re in a relationship, you can decide together what the next chapter holds or start making bigger plans together. If you’re unattached, you can go anywhere and don’t have to worry about credits transferring. The world is your oyster! There are some instances where it absolutely makes sense to slow down your progress toward a degree. It’s okay if you need to take more than the typical two- or four-year (or even three- or six-year) track. Working parents or non-traditional students may find they can comfortably handle a half-time load with their other commitments. A full-time course schedule may be impossible to maintain for them. If you’re already working in a job that you like and are getting reimbursed for school, going at a slower pace could actually put you at a tax advantage. Not to mention some people take fewer classes at a time so they can pay more out of pocket and take out less in student loans. You should choose what works for you and helps you progress toward the ultimate goal of getting the education to support your dreams. Just make sure you have a plan that works for you and keeps you motivated to graduate! Tax time is here and hopefully, you’ve already filed. We also hope you don’t run into any of these wacky tax situations! Make sure you get expert help filing if you don’t know what you’re doing. No one wants to mess with the IRS, and you want to maximize the amount you can get back or keep for your financial goals. Clean eating isn’t deductible, no matter how healthy. You can’t deduct money you spend on a healthy diet as a medical expense. John Kane, CPA, reported at Credit.com that a client tried to deduct the cost of the family’s foods. Sure, the groceries were non-processed and healthy, but that doesn’t make them count as a medical expense. Sorry! Some people have tried to use negative numbers on their tax return, maybe innocently thinking that’s what you’re supposed to do. But according to the IRS, you’re supposed to use “0” in any instance where you have a negative amount. What is a “Good” Credit Score Anyway? Go old school with pen and paper. Many millennials live abroad or would like to in the near future. Did you know that you may not be able to file electronically if you are a US citizen and live outside of the country? Expats may find that they have to fill out the long forms because electronic forms require a US address. Buying a business? Hire a tax expert. It’s super important to have the right experts and legal help on your side when you’re starting a business endeavor. One reason is successor liability. There are certain business debts or payments that you might not be responsible for, but back taxes don’t go away so easily. People can get burned by IRS liens if they don’t check to see what kind of taxes the business owes. What kind of employee are you? It matters—a lot! Some businesses wrongly categorize their employees as independent contractors. In the case of a youth soccer association, they got in trouble with the IRS for requiring the referees to file as independent contractors. Businesses that aren’t following labor laws when it comes to tax filing could face big fines. 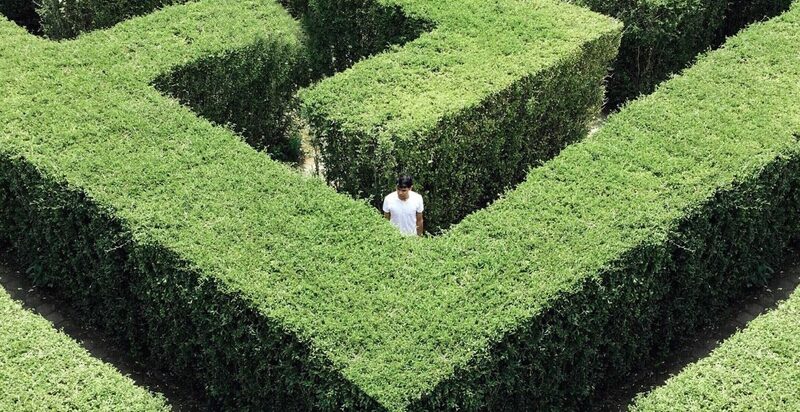 Don’t try to hide from the IRS. Just as a general tip, don’t try to dodge or outsmart the IRS. That’s a really bad idea. The IRS can go into your bank accounts with a levy if you owe taxes for long enough, so there’s no point in trying to hide. Working with them ASAP when you realize that you owe taxes is your best bet. You can probably set up payments, but only if you are on the ball. Wondering about some of the wackier tax deductions? There are plenty! Moving for work? Your expenses could be tax deductible, including moving Fido. Don’t forget to keep track of expenses for moving your pets. When it comes time to list dependents, stick to human dependents only. People have tried to deduct pets, but that’s a no-go! If you’ve got a guard dog for your business, on the other hand, Cujo’s upkeep would be a tax-deductible business expense. If you are trying to deduct the miniature guard dog that protects your house, you’re out of luck. Pools can increase your homeowner’s insurance and cost a pretty penny to maintain. Did you know that having a medical condition that’s helped by swimming or water therapy could mean your pool expenses are tax deductible? You may not be able to deduct your grocery costs because you like clean eating. You may be in luck if you’re working with a doctor to do things like lower your cholesterol and BMI. If you’re making adjustments as part of a health plan, there might be ways to deduct some of those costs. Check with your tax pro! Just FYI, you’re supposed to pay taxes on income even if it was attained as part of a crime or doing something illegal. Not that we’re making any accusations! Trying to kick the habit? Supplies you use to quit smoking can be tax deductible, too. Just another reason to quit!